I finally got round to making these from the Millennium cookbook. They’re in the appetizer section but I decided to make bigger versions and eat them as a main course. 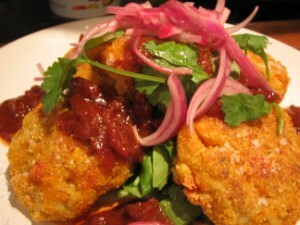 They’re served with a smoked onion and chipotle sauce and some lime pickled red onions and the recipe is available on google books. The risotto needed making in advance then putting in the fridge to set. Except that it didn’t. It was the runniest gloopiest mess I’ve ever seen. There was absolutely no way it would form into cakes and be coated with the flour and spice mixture. I was a bit stressed by this point so I added a bit of flour into the mix and put extra polenta in the coating mixture. They more or less worked this way. I think there was too much water in the silken tofu mix which meant it wouldn’t set. The sauce also needed a little thinning down. But, in spite of the recipe being wrong, it did taste delicious! This entry was posted in Millennium by efcliz. Bookmark the permalink. Hi, you have interesting post! I’m definitely going to bookmark you! Thank you for your info.And this is wedding cakes site/blog. It pretty much covers “cakes” related stuff.